Hi I’m Simon the owner of jokerswildfuncasinohire. 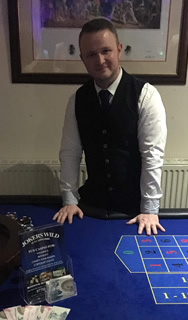 Jokerswildfuncasinohire is a new fun casino company based in the small town of Bamber Bridge just a few miles from Preston. We can cater for events in Manchester, Liverpool, Cheshire, Leeds, London, and as far north as Scotland. Jokerswildfuncasinohire brings over 14 years of gaming experience, 6 of which were working in uk casino as an dealer/inspector, 1 year working as a Casino dealer on cruise ships. Cunard and Holland America line. Finally 7 years and counting working for other fun casino companies across the North West whilst taking on my own adventure in the world of fun casinos. Our aim is to provide you and your guests with the best possible entertainment. We will recreate the thrills and excitement of a professional casino at a venue of your choice. So why book with us? Well jokerswildfuncasinohire staff excel in customer service and use a professional demeanour. We guarantee your guests will have an outstanding evening of entertainment. Our ability to create an overwhelming first impression ensures your guests are provided with a positive lasting impression.